Paul Cook is a Principal Lecturer at Arizona State University in the English Department where he teaches a wide variety of literature and writing courses. He also teaches an on-line science fiction course. He has halso taught authors as diverse as Thomas Pynchon, John D. MacDonald, Elmore Leonard, Carlos Castenada, Ezra Pound, and John O'Hara. These days he writes mostly science fiction and has published stories in The Magazine of Fantasy and Science Fiction, Isaac Asimov's Science Fiction Magazine, Amazing Stories,and various little magazines. He is also a member of the Science Fiction Writers of America - the SFWA and the Society for Scientific Exploration. He has also written poetry and has published approximately 100 poems in journals such as The Georgia Review, The Seattle Review, and The Carolina Quarterly. He is also the author of eight science fiction novels, among them Fortress on the Sun (1997), The Engines of Dawn (1999), and Karma Kommandos (2007). His novels have been translated and published in Japan, Italy, Portugal, and Germany. 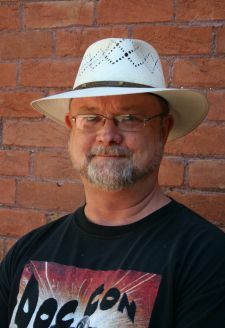 He most recently wrote the introduction to Tanar Of Pellucidar by Edgar Rice Burroughs from Bison Books (University of Nebraska Press, 2006) and is the Series Editor for the Phoenix Science Fiction Classic series from Phoenix Pick/Arc Manor books. He has also published over six hundred classical music reviews, principally in Classical Pulse! and The American Record Guide. He is also the Series Editor of Phoenix Pick's Science Fiction Classic Novels series from Arc Manor publishers (Rockford, Maryland). He is a member of the Science Fiction Writers of America and the Science Fiction Reasearch Association.